Rakhi is that time of the year where love, care, and affection are shared among siblings. Everyone tries to make that day memorable for their siblings. Buying special gifts is a tradition after all the aim is to bring smiles to their siblings. It’s the sister’s duty to buy a special gift for their brothers. Despite all the fights they have had. This day they give gifts to show how much they love him. Now your brother may have a sweet tooth and is crazy for sweets or chocolates. You can check in Rakhi.in which is an online Rakhi site with a variety of Rakhi gifts. So, you can send Rakhi for brother online. Also, since it’s online, you won’t have to hop around shops to buy Rakhi. It is hassle-free and easy. 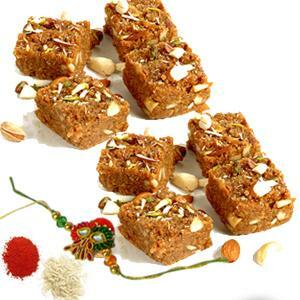 So, here are some gift packages you can check in Rakhi.in for your brother with a sweet tooth. Rakhi with sweets- with the ever-changing society, people are not having any time. So, taking out time for themselves and to pamper themselves with their favorite sweets is not possible. 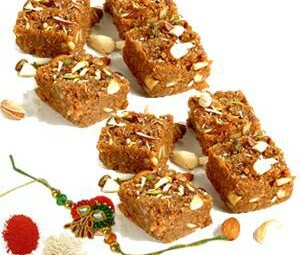 If your brother loves some traditional sweets, then check out Rakhi.in for a variety of sweet hampers. You can give him a box of cashew badam, a box of gulab jamun, Bourneville, soan papdi, laddu treats and many more. All this in a budget. These also come in beautiful packaging, especially for Rakhi. These will surely bring a smile to your brother. Rakhi with chocolates- Nowadays kids are crazy for chocolates. You give them a chocolate any time of the day and they will gladly accept it, completing it whole in a few minutes. Not only kids but everyone. It is impossible to resist a good chocolate for anyone. Your brother for sure is crazy for chocolates as well. So, why not give him one. You can visit Rakhi.in for gift hampers that include chocolates. The range we provide is mouth-watering and attractive. 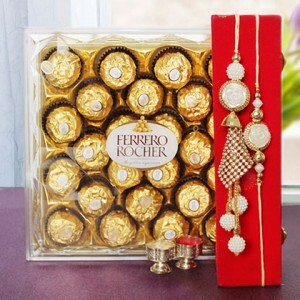 We have Rakhi combos with Cadbury Celebrations, Ferrero Rocher, Lotte Choco Pie and many more. Check out now to find many attractive goodies. 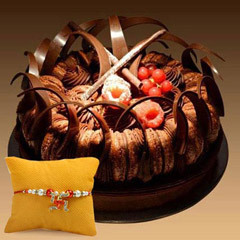 Rakhi with cakes- A person with a sweet tooth must love a cake. Everyone loves a cake. So, giving your brother, who has sweet tooth, a cake is a good idea. We provide many gift hampers with cakes. We give a chocolate cake, black forest and many more which are beautifully decorated. 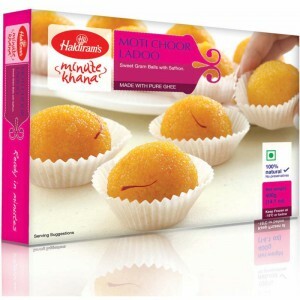 Haldiram Sweets- Rakhi.in gives a variety of Haldiram sweets. We give Haldiram’s Soan Papdi, Gulab Jamun, Dry Petha, Soan Cake, and Kaju Katli. These are some Rakhi gifts for brothers you can check out. All these you get online and within a profitable budget. We also send your Rakhi gifts around the world and many states in India itself. Everything from packaging and delivery, you can trust us. Your Raksha Bandhan celebration won’t be ruined. I hope you can celebrate your Rakhi with love and affection. May you be able to bring smiles on your brother and your whole family? I wish you a very happy Raksha Bandhan. First Rakhi Celebration After Bro’s Marriage-How To Plan?